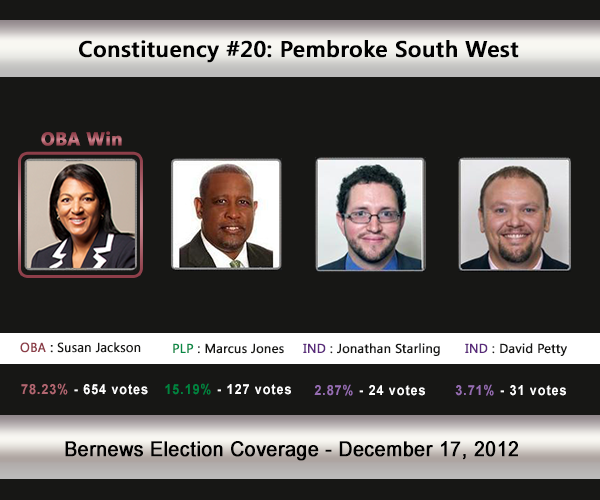 [UPDATE Dec 17: Election Results] Susan Jackson [OBA] has defeated Marcus Jones [PLP] and Independents David Petty and Jonathan Starling in C#20 Pembroke South West. Considered by many to be a safe seat for the Opposition, Pembroke South West will see a new MP in the House as the incumbent Louise Jackson is retiring. Four candidates are contesting the seat: Marcus Jones will stand for the PLP, Mrs Jackson’s daughter Susan Jackson will stand for the OBA, while Jonathan Starling and David Petty will run as Independents. The seat saw the largest margin of victory in the 2007 General Election, with Mrs Jackson [under the UBP] earning 83% [711-145] of the vote vs the PLP’s Laverne Furbert. In the 2003 General Election, Mrs Jackson won with 81.83% of the vote against Neville Darrell. 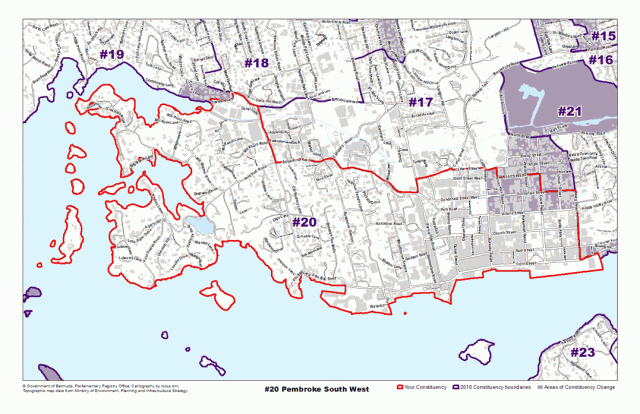 The areas the Pembroke South West constituency consist of, or is located by, includes Pitts Bay Road, Serpentine Road, Woodlands Road, Canal Road, Laffan Street, Cedar Avenue, Victoria Street, Reid Street, Cavendish Road, Lane Hill and more. Marcus James Anthony Jones, an experienced professional in the hospitality industry, is the candidate for the Progressive Labour Party in Constituency 20, Pembroke South West. Mr Jones, the son of William and Mary Louise Jones, was born in 1965 and spent his formative years in Somerset. He was educated first at West End Primary School (1977) and then Warwick Academy (1982) where he received his high school education. He then continued his studies overseas at Trent University in Peterborough, Ontario where he earned his Bachelors Degree in Economics (1988). As his interest centred on the Hospitality Industry, he was able to attain diplomas at Bermuda College in Hospitality Supervisor and Food & Beverage Controls courses. His work experience has been in the hotel sector, specifically within the area of Accounting and most recently he was promoted to the post of General Manager. He has filled the role as Director of Finance for several hotels locally, one of which was Elbow Beach Resort (1997 – 1999) and overseas at the Novotel Toronto Centre (1999 – 2001). Later he was responsible for opening three hotels on the island…The Wharf Executive Suites (2002) Grape Bay Beach Hotel (2004) and 9 Beaches Resort (2006) in the capacity of General Manager. On completion of his tenure at the Department of Tourism as Manager, Hotel Administration, in 2010 he started his own hospitality consultancy business, Covenant Hospitality Solutions Ltd.
of an EEZ designation in the East End. His keen commitment to public service has seen his involvement not only within the PLP but in a number of community groups. His community work has also included being a participant of the Foster Parent Programme, President of West End Primary School PTA and most recently in the formation of the Cook’s Hill Neighbourhood Watch whose purpose is to enhance community spirit, quality of life and safety amongst its residents. He is active in his local church, Better Covenant Christian Fellowship, and is an avid sportsman. He and his wife Sophia are the parents of two children, Caleb and Abigail. Jonathan Starling has been an active voice in Bermudian politics since 2003 and an online political commentator since 2007 with his Catch-A-Fire blog. A community activist in Bermuda, Canada and Scotland, Jonathan has been involved in movements to promote peace, social justice, anti-racist action, women’s rights and a healthy environment for all. With a background in Biology and Anthropology, and Master’s degrees in Ecological Economics and Urban and Regional Planning, Jonathan has the expertise and experience that Bermuda needs for balancing the competing interests of society, the economy and the environment. Having worked for the Department of Conservation Services in Bermuda and Forest Research in the UK, he has hands-on experience with Bermuda’s environmental problems and knowledge of international best-practice on balancing social, economic and environmental issues. Passionate about social justice, gender and racial equality, participatory democracy and a healthy, safe and green society, Jonathan Starling has the experience, skills and passion to work for you as an independent voice for the island’s most pressing issues. Jonathan Starling will work passionately to make issues of social, economic and environmental justice central to decision-making and policy. He believes the environment is much more than corals and trees – the environment is where we live, where we work and where we play. Susan is a fourth generation Jackson to commit to public service. Her father was the late Senator Albert Jackson, an Independent who served as Senate President for 12 years. Her mother is Louise Jackson, former Member of Parliament and longtime Shadow Minister for Health and Seniors. Her great grandfather was the second black Bermudian elected to the House of Assembly, in 1887. Susan is a corporate communications specialist having spent 20 years writing for electric, telecommunication and financial institutions; Belco, BTC and most recently HSBC Bank Bermuda Limited. She also worked in the Department of Education for seven years as a Speech Language Pathologist. She is committed to community service and has volunteered for a variety of social support organisations including Mirrors, YouthNet, PRIDE and Women’s Resource Centre. Educated in Bermuda, England and the United States, Susan has a BSc. in Speech from Emerson College, Boston, Massachusetts and professional designations from Communication, Advertising and Marketing(CAM) Education Foundation in London, England. “There is much to do to make things right, much to repair to get this country working again,” she said.